This ground beetle, like others of its taxonomic group Tribe Cychrini​, is incapable of flight due to fused and highly reduced wings. As its name indicates, the tuberculate rare snail-eating beetle preys upon snails, and it has bumps (tubercles, hence 'tuberculate') across its back. It is nocturnal, and it may be found in moist shaded areas of coniferous forests, clearings, and moraine habitats. It has been recorded from BC south to California. Click here for general information on ground beetles. These ground beetles may require taxonomic expertise to identify correctly to species level; click here for a dichotomous key for Tribe Cychrini in North America. 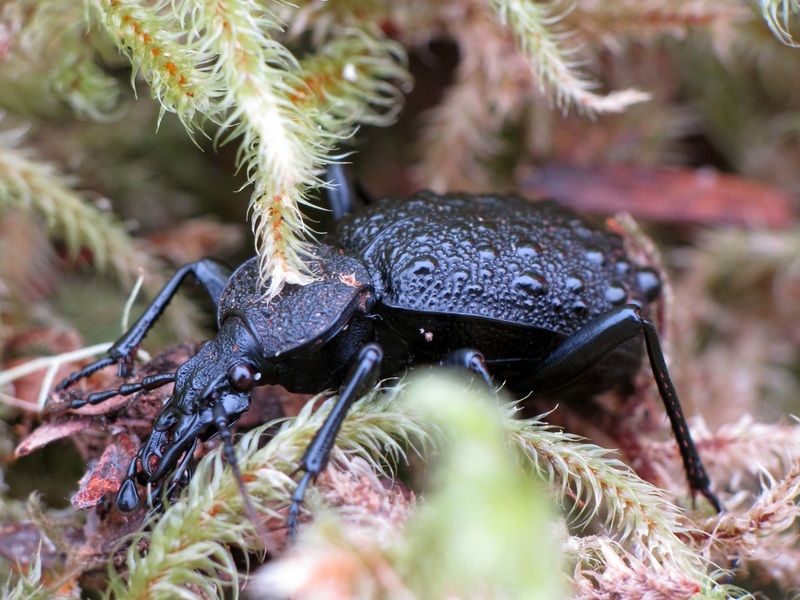 Click here for a short video clip of a tuberculate rare snail-eating beetle. Cychrus tuberculatus T.W. Harris 1839. Western Hemisphere Caraboidea. Accessed 22/03/2018. Tribe Cychrini. BugGuide. Accessed 22/03/2018.